SHORTBREAD : I have always liked butter…. but in small quantities – feeling that too much of a good thing overwhelms the pleasures of the palate. Unfortunately, when I was a little girl my grandfather did not share these sentiments, and when asked to make us sandwiches for tea, he was prone to far more generous layers of butter, than bread & cucumber combined. There was then a mad dash to remove 90% of the golden spread & hide it in a napkin, before he returned to check that everything was ok! All this being said, there is one area of baking where the less is more butter philosophy is brought into question – this being sablé (shortbread) cookie making. Butter is the defining building block, the foundation of this biscuit, without which you would be left with smiply flour & sugar. It’s quality is therefore of the utmost importance and once you have tasted these cookies, home made with fresh butter, you understand why the storebought variety always seems to have this slightly unpleasant aftertaste … it’s the butter. It reminds me of the final scene in the movie ‘Mostly Martha’, where Martha (a famous Hamburg Chef) tastes the lemon tart her psychiatrist has prepared for her, using her recipe. you heated the oven to exactly 210°? you didn’t over knead the pastry? and the sugar, did you use Belgian sugar? Do you mean to say that you can tell what kind of sugar I used? No, of course not, but I can tell what kind you DIDN’T use! 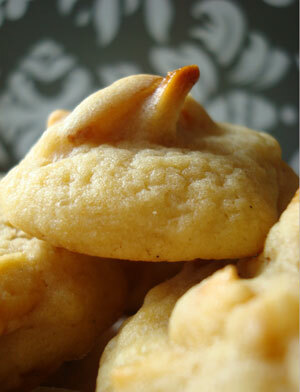 DROP COOKIES: are those that require just a finger and a spoon, to drop small quantities of dough onto cookies sheets. This is the no fuss no muss method, especially handy when baking with children. CUT-OUT COOKIES: the pretty though time consuming cousin… involving the chilling & rolling out of dough, to make lovely shapes, that can be iced and decorated. CYLINDER COOKIES:are made by rolling the dough into a cylindrical form & then slicing it into rounds. Often used to make shortbread cookies (sablés). 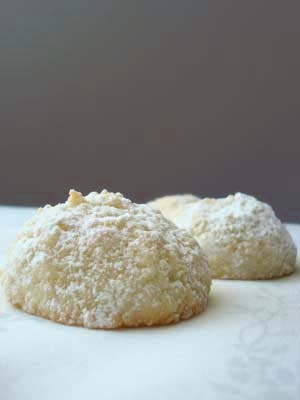 My recipe for honey almond cookies falls into the first category, for though I love making pretty cut-out cookies, and will soon be doing so for the holiday season, I often need a quick baking solution after work. So where is the ‘click & sniff’ button when you really need it – there is a button for just about everything else now a days, and it would definately be worth while, as the scent of toasted almonds with caramelising honey, will leave you fainting from felicity. Much of my mental cooking is done in bed…. Some people count sheep to fall asleep…. “not I”, said the duck, (yes it is the barn yard theme today … ), I find myself mulling over the contents of our kitchen cupboards! Ingredients to be used, combined, obtained – dreamily preparing what to cook or bake the next day. A perfect obsessions for the insomniac cook! Soba noodles, broad beans & chickpeas (which reminds me, I must make some hummus), to the vanilla beans, saffron and pecans, past the buckwheat flour (oooh crèps for breakfast! ), almond meal & rolled oats, ah yes the new molasses (I have plans for you!) – and what this hiding in the corner…. 2 bars of Cailler’s Cacao Extrême 74% dark chocolate! How could these have gone undetected for so long! My cupboard radar must be off. That got the wheels turning. The cookie jar was empty & my chocolate chip recipe has been asking for a make-over … well not in so many words… but there just never seems to be enough chocolate…. C is for cookie …. well that all depends on where you come from. In England & Australia B is for Biscuit and in Spain G is for Galletas, whereas in Italy they have a completely different range of names from amaretti to biscotti. Going back to the root of the English word ‘cookie’, we find that it was derived from the Dutch word koekje, meaning small/little cake. According to culinary historians, these little cakes were the product of chefs using small amounts of batter to test the heat of their ovens before baking. I will soon be taking a trip over to Holland, to visit my brother and to taste the local delicacies – he says they have excellent local cheese & yogurt, so I will be reporting back! In regards to reporting back, each year I find that the decrease in autumn temperature, brings with it an increase in my desire to cook with fragrant spices. However when it comes to my spice rack, I fear I have lately been playing favourites …. exploiting certain spices while marginalsing others to their traditional roles. A good example of this is nutmeg – great for beshamel sauce, perfect for rice pudding and even better when used in savoury spinach quiche. But should that be all? Is that everything this little “nut” has to offer?? Perhaps I should be looking outside the recipe box, to the sweeter side of life. Which got me to thinking about my mother’s delicious sugar cookies and how nicely they would compliment the aromatic flavours of nutmeg. And as they say, whoever they are, the rest is history!